Slideshare is a popular site for hosting a huge range of slide shows, and is fast becoming a common tool in a trainers toolkit. The slide shows at Slideshare are great but they lack the support of a learning management framework, meaning that a trainer has no way of knowing who has viewed the content and if they understood it. From a training perspective this is the same problem that exists with emailing around PowerPoint slide shows to trainees. Litmos overcomes this issue by making it easy to track which trainees have viewed each piece of training material, specifically in this case a SlideShare slide show. From the Designer, open the training course that you want to add the slide show to. 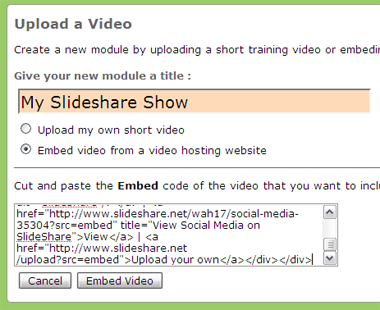 In the CourseEditor select "Upload Video", then give your new module a title and select the "Embed video from a video hosting website" option. (Note: Although you want to add a slide show it works in the same way as a video). 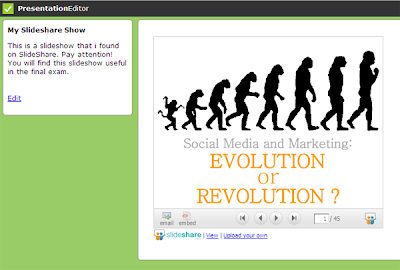 Now in another web browser find the slide show that you want to use from SlideShare.net and copy the "Embed in your blog" code, which is found on the right side of the screen. 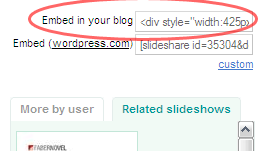 Then switch back to Litmos and paste this into the box provided and click "Embed Video". That's it! You now have a Slideshare slide show included in a training course and the ability to track which trainees have viewed it.